In paper, paint or in biological tissue, light travels in straighter lines than expected when it's partially absorbed. Physicists from the University of Twente and Yale University made this surprising discovery. Their insight could improve medical imaging in biological tissue and result in more efficient LEDs. The researchers published their work in Physical Review B. Light particles that travel through a scattering material normally follow a so-called random walk, staggering like a drunken man. The photons are repeatedly hindered from moving in a straight line due to irregularities in the material. Furthermore, light behaves not only as a particle but also as a wave. Light waves that travel along different paths reinforce or extinguish each other. This interference between long and short paths makes it even more difficult to obtain information from the transmitted light. A Dutch-American research team discovered, however, that in opaque materials such as paper, paint or biological tissue, the light path becomes much less random in presence of absorption. Based on their numerical analysis the researchers found that the long, meandering light paths are suppressed far more than the short straight paths. Consequently the straight paths of the light continue to exist with increasing absorption whereas the long, winding paths are extinguished. The result is that light is scattered far less, hence imaging inside and through opaque materials is much improved. This is counterintuitive because normally light absorption is detrimental for imaging. FOM workgroup leader Allard Mosk: "Although the absorption reduces both the signal and the interference, surprisingly it seems that the interference decreases more strongly. Consequently enough signal remains to form an image through coloured, opaque materials." The lighting industry has responded positively to the results. According to FOM workgroup leader Willem Vos, colour conversion in white LEDs can now be realised far more efficiently. Therefore smaller quantities of valuable resources, such as rare earth metals, are needed. Absorption results in straight paths. By means of numerical calculations the researchers could track the distribution of the light intensity within an opaque material. The light enters the material from the left-hand side. In the top figure several scattering paths are seen, showing that the light follows a random walk through the material (blue curves). 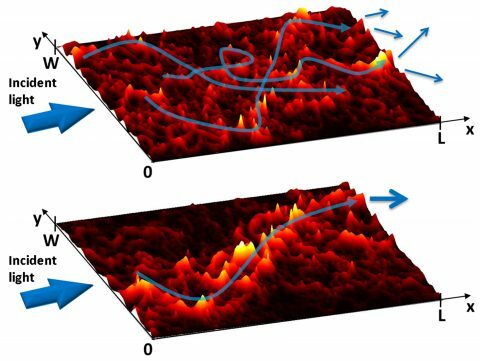 The light leaves the material in random directions (blue arrows), making imaging impossible. The bottom image shows what happens in an absorbing opaque material such as coloured paper or paint. The light propagates via straighter paths and exits in nearly the same direction as it enters (blue arrows). Consequently a better image is visible on the right side.